For the past four years, Root Division has dedicated one month of our exhibitions programs to a juried exhibition of current Bay Area MFA Candidates in an exhibition and archive project called MFA Now. This project will continue at Root Division biennially with the next presentation in February 2017. This year we wanted to do something a little different, and join in the national dialogue around valuation of advanced art degrees. This February, we're opting to highlight the many talented and successful artists who have opted out of the degree route for one reason or another, in a counterpoint juried exhibition called MFA Never. The goal of the MFA Never project is to create room for dialogue around alternatives to the MFA route, especially in thinking about how higher education can be exclusive in terms of financial viability, and in representing artists of color, queer artists, "outsider" artists etc. We are looking to create visibility for artists who have found a life and practice in the visual arts outside of the academic machine. MFA Never was conceptualized by Rhiannon Evans MacFadyen, to create opportunity for underrepresented artists, those who are unaffiliated with alumni networks, and may have not had the debut opportunity offered by the MFA Thesis exhibition. MacFadyen is the founder of A Simple Collective, a contemporary arts organization dedicated to, "access, equality, ingenuity, creativity, and independence." The MFA NEVER 2016 Archive, is an inclusionary publication of all eligible applicants, set to be released in February 2016. 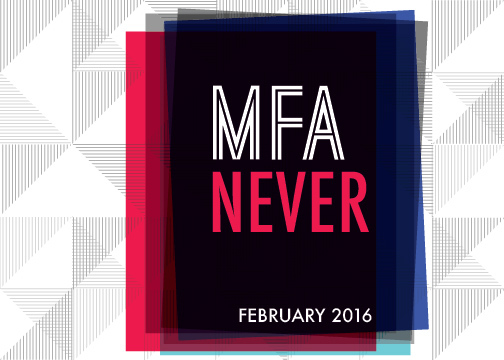 All eligible artists who submit to MFA NEVER 2016 will be featured in this archive. The book includes a full page dedicated to each contributing artist and a compilation of essays by Root Division staff, and the panel of exhibition jurors, serving to unpack some of the issues surrounding decisions to not pursue higher education, navigate the contemporary moment in Bay Area outside of the MFA Programs, and find connections between the exhibiting artists. Jurors: Submissions will be reviewed by a panel of arts professionals. List of jurors forthcoming. *“Visual Arts” (for the purpose of this opportunity) include sculpture, painting, drawing, film/video, photography, ceramics, textiles/ fiber arts, new genres, film/ cinema, design & technology, conceptual and Information Arts, intermedia/installation and social practice. Note for artists submitting video: Please submit a video still (at specs listed above) for print in the publication. For juror review, include a link to the video at the end of the statement section on the online application. For best results, we highly recommend links to Vimeo or YouTube rather than individual websites.